3 bedrooms have a double queen size bed, 3 bedrooms have a double bed, 1 twin room with single beds and 1 twin room with 3/4 double beds. 4 en-suites and 3 general bathrooms plus toilet on ground floor. The 2 main bedrooms have shared access to a large covered terrace . Both have a balcony. Original artwork and murals are on the walls. Wooden floors with rugs. The kitchen is modern fitted with a large Falcon cooker, fridge/freezer and good quality accessories. The laundry has a washing machine and tumble dryer and separate sink. The dining room has a large solid oak feature dining table. Additional drinks fridge. Wifi throughout. The sitting room has a stocked library of books and DVDs for guests use and French doors leading to a terrace overlooking the Dordogne. The heated pool is exclusive to the villa guests only. External terraces have ample shade and seating for relaxing and dining. Welcoming sophisticated house with 8 double bedrooms and 2 bedrooms in independent lodge - rented seperately. Elevated riverside position designated of special interest overlooking a series of ancient locks. Maison de Maitre with total renovation by French designer. Specialist paint finishes. All mod cons incl. satellite TV, central heating and wood burner. Private heated (seasonal) salt infinity pool, table tennis, Wifi, laundry, fitted kitchen, water softener, bikes. Several south facing decks, terraces and BBQ. 100m of fenced river frontage. 12 minutes from airport. There are 120 vineyards in the Bergerac region and of course the Perigord is home to duck and foie gras, so a good meal and wine is never far away. For the more energetic, there are plenty of places to visit, prehistoric caves, medieval villages and Bastide towns, night markets, festivals and sporting activities such as golf, canoeing, fishing and horse riding - something for everyone! The property is suitable for young and old with ground floor accommodation in the separate Lodge. Note: The Lodge is rented separately - not part of Villa rental agreement. 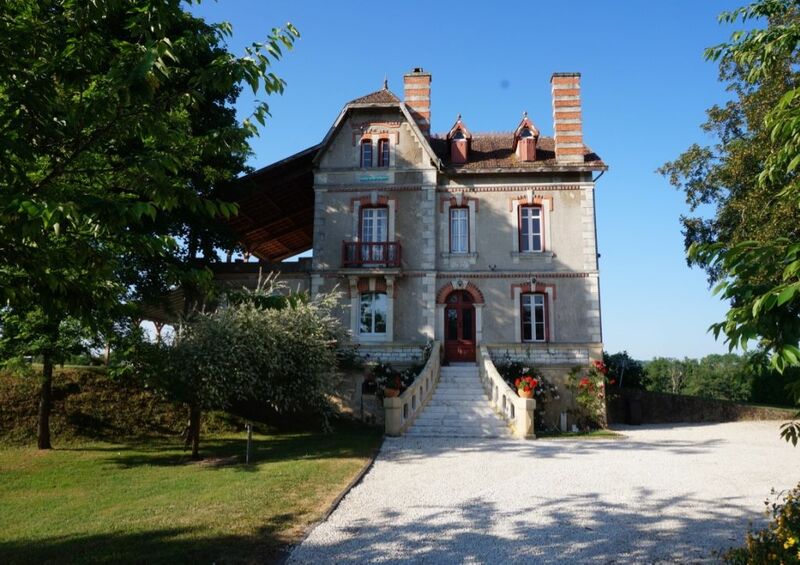 Just a fantastic imposing position overlooking the majestic river Dordogne. Very easy to get to as serviced by several economy airlines all year round. Locals are friendly. The winter is very much shorter in Bergerac. The local food and wine is superb. The wine is not stuffed full of chemicals.The house and gardens offer us a grandeur we could not hope for in England or Ireland. This place has enriched our lives and gives us a fabulous escape. Land line can be provided on request. Fast Wi-Fi service at house. Owner however will not be liable if service fails for any reason. Bath and hand towel provided for each person. 2 number, Quality gas and electric Falcon ( Aga made). Feature dining room with large solid oak table as well as outside dining tables and chairs. Large collection DVDs and records. At guests own risk. Not available with-out house security deposit. Golfers have a choice of four courses within easy reach of the house. There is a par-27 course at Sadillac, an interesting 9 hole course at Tombaboeuf, 9 hole course at Chateau Les Merles and a top class 27 hole complex at Château des Vigiers. The 9 hole golf course of the Chateau Les Merles is less than a mile away with a golf driving range and a fine restaurant / Bar with Torch light courtyard. 10 x 5m Infinity pool heated (seasonal) for Villa guests only. Notes on accommodation: For more information on the Lodge, please see the owners website (link below). Heating and hot water is included within the rates. The swimming pool ( Villa only) is fitted with an alarm but is not fenced and is heated seasonally. Care with children is needed especially on the first floor terrace. Outside: Garden furniture incl. sun beds, tables, chairs, barbeque's are provided. An exterior table tennis table and bikes are available for the main house only. Additional Summer houses to both gardens. The main house has two large timber terraces both with tables and chairs. Villa Acacias is perfect for a family holiday of mixed ages. We ranged from 11years - 80 and there was lots of activities nearby. We went boating, bicycling, kayaking, picnicking, swimming in the lovely pool and visited 3 nearby Chateaux. The BBQ and pool area are perfect for family meals and we enjoyed the table tennis and the smaller terrace where backgammon and card games were played and wine was enjoyed overlooking the Dordogne River. A great holiday. We came to Villa Acacias for a 40th birthday celebration. In total there were 4 families (8 adults and 7 children) and the villa was a perfect size to house us all, with ample space and seating. The kids loved the pool which was even suitable for our 18 month old as it has steps leading down. It was heated to a pleasant temperature meaning we could swim early in the morning and late into the evening. The table tennis table was also a hit with kids and adults alike! All the bedrooms are a good size and either have an en suite or a bathroom next door. The house is well equipped with more than enough cutlery, crockery etc for everyone. In addition the outdoor space is really lovely with shady areas to sit, beautiful grassy areas and lots of loungers. The owner Jon was available whenever we had a query and is a very friendly chap. He has done a fine task in restoring the villa from near ruin although as with all old buildings there is always more that needs doing! The location was fantastic for us, being only 15 mins from the airport and close to a number of good vineyards (there are a lot of activities for kids nearby too - so something for everyone!). All in all I highly recommend this villa and hope to return in the future..
We have had the pleasure of staying at this amazing property a number of times previously and we really love the wonderful accommodation, sense of history and remarkable views. This time was a special occasion, my parents-in-law's 50th Wedding Anniversary and we were gathering 23 family members from all over the world to celebrate with them. We were confident that everyone would have a great time but of course we were a little nervous...... We needn't have been, from age 3 to 73 everybody had a wonderful time and the accommodation meant that we all had our own space when we needed privacy while also being able to have big rowdy family get-togethers every night. The pool was a great facility and it is beautiful designed, suitable for young and old. The house was equipped with everything you could wish for and more and there are lots of interesting sights and attractions locally. One thing you must do is take a kayak down the Dordogne, one of the highlights of our trip - so good we did it twice! We're looking forward to returning. Villa Acacias ticked all our boxes. It was spacious, comfortable, clean and well equipped. The outside area was a great space and the pool was put to good use. The riverside location provided plenty of bird life for our twitchers. Jon was a great communicator. Every email was replied to very quickly and efficiently. Excellent customer service. Locally, we dined at Chateau Les Merles which was fantastic. They dealt with 18 of us with suberb service. We spent an afternoon wine tasting at a chateau a few miles from Bergerac and a couple of afternoons canoeing down the river. Beynac is pretty. Issegeac provided a nights entertainment with a Son et Lumiere and the Sunday Market was well worth a visit. I would not hesitate to recommend Villa Acacias for a large gathering. Hope to visit again in the future. Thanks Jon.....you have a lovely home. A party of 15, ages ranging from 4 to 80 years old. Everyone said that they would have liked to stay another week, they had thoroughly enjoyed the villa, the area etc. This is a magnificent villa with adequate space for large parties who may want privacy, but also enjoy being together for meals, swimming, reading etc. Excellent choice that will always be on our list for a re-visit. Thank you Jon Couldn't have dealt with a more genuine and understanding gentleman. This area is Bastide country with many fine Castles. Fishing, horse riding and canoeing is nearby. St Emillion is less than an hours drive away. You are in the heart land of many wine routes. The nearest coast is about two hours drive. However there is a lake beach nearby. Bergerac airport is about 12 minute drive away. The average drive from Boulogne including stops is 10 hours. Cheap flights by Ryanair and Flybe from the UK. Direct flights to Ireland available from Bordeaux, a 1.5 drive away. The house is situated in a small Hamlet between Lalinde and Mouleydier. There is one shop in the Hamlet selling bread and provisions. The swimming lake at Lanquais is less than 10 mins drive away. Villa Acacias is an ideal venue for big groups. Booking Notes: A booking deposit is required at £200 for the villa and £100 for the Lodge. This is refundable up to 10 weeks before proposed visit when balance is payable. Cancellations after this time refundable if relet less costs. A security deposit of £400 for the villa and £200 for the lodge is required by way of post dated cheque. This will be returned or destroyed if no serious damage within 2 weeks of departure. Towels /linen provided. Changeover Day: Saturday during peak times: arrival after 3pm. Changeover day is flexible out of season (winter time). Departure by 9am to facilitate cleaning team. Flexibility in leaving luggage in basement etc. Notes on prices: Prices quoted are inclusive of Laundry and cleaning.